LEGO Coloring Pages – Yay! We found more than 180 free printable LEGO coloring pages and LEGO fans are going to love the selection. 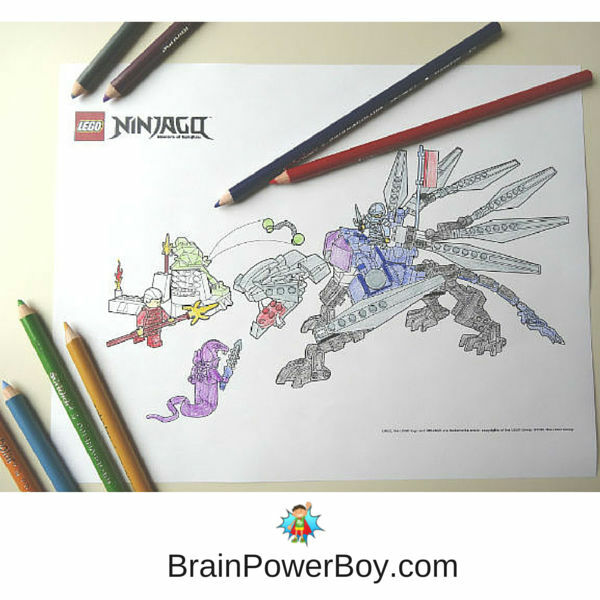 If your kids love to build with LEGO, they are going to go crazy for these LEGO coloring sheets that you can print for free! Grab their favorite LEGO characters, print out the pdfs and keep these on hand for whenever you need a quiet activity. We are always looking for interesting things to add to our LEGO series on the site. Coloring is so relaxing and it is quite the craze lately. All of these pages are found on various official LEGO sites so you will not run into issues when downloading. I will be updating this page as they come out with new coloring sheets. This took a long time to put together. Pin it, or bookmark it, so when you need some coloring pages you can just come back here and print the ones you want. Looking for the Latest LEGO Coloring BOOKS? Don’t Miss These! These LEGO Duplo coloring pages are perfect for the younger set. With 41 different sheets to print this should keep your little LEGO fan having fun for quite some time. These are nice because the images are bigger and easier to color. Includes castle, farm animals, cars and figures. Another great choice for younger kids is the selection of LEGO Juniors coloring sheets. There are 41 different selections including police, fire, race car, construction, Spider Man, farm, Batman and pirates. 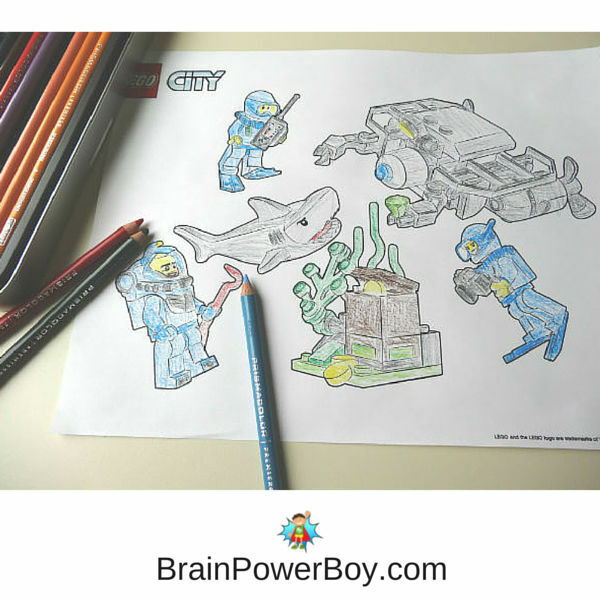 We found LEGO City coloring pages in construction, police, vehicles, deep sea and more. If you are looking for sets go here >>> LEGO City sets We love them because you can do so much with them. LEGO Marvel Superhero Coloring Pages featuring Spiderman, Age of Ultron, Avengers, X-Men, and Civil War. If you like your superheroes of the DC variety (we do!) LEGO Justice League and LEGO Batman pages. I’m hoping they add more pictures soon. There are only 3 LEGO Jurassic Park printables but they are really neat so be sure to check them out. The NEXO Knights has a nice set of coloring pages too! Get them here. There are a lot of Ninjago pages both for younger kids and more intricate pages for older kids. Ninjago pages. The Batman Movie Coloring Pages NEW! 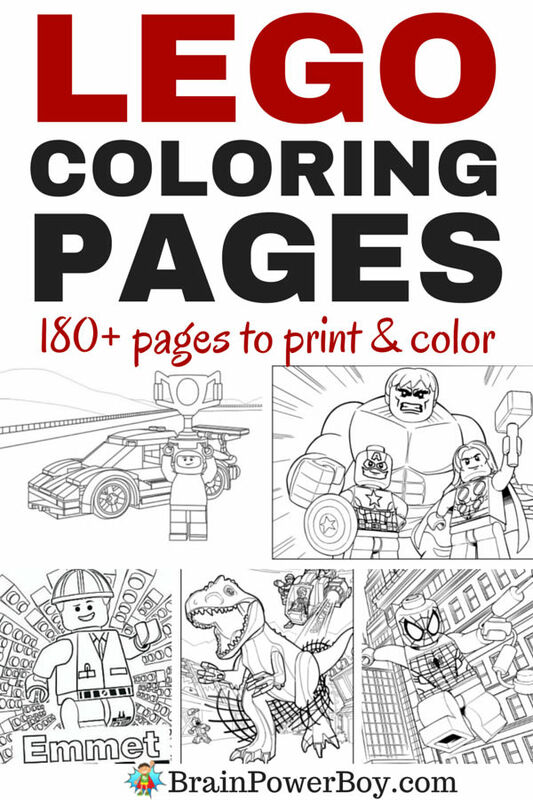 UPDATE: More LEGO coloring pages have been added to our list! Hurray! LEGO, The Batman Movie has some coloring pages as well. Here is a nice collection of coloring pages with heroes and villains..
Coloring can be a very good way to relax. I even saw an article on how coloring may be as good as meditation for relaxation. For coloring, the Prismacolor line of pencils are our favorite pencils by far! They are high quality pencils that last a long time. I am so happy with these pencils and how they glide smoothly over the paper making it easy to color. The results are great. My son has the Prismacolor soft pencils and I have the Prismacolor Scholar set. Both are excellent. If you would like to join your kids while they are coloring, and I highly recommend you do so. 175+ Free Printable Superhero Coloring Pages and these wonderful adult coloring pages from my friend Clare. If you are looking for more activities for boys . . . we have a lot! Wow! That’s a lot of colouring pages – thanks so much for tracking them down! No kidding! I was surprised to find so many. You are most welcome – I was happy to do it. Hi Carolin – I guess so, right? You won’t run out any time soon. I don’t think I’ll need to buy a colouring book again … ever! My youngest is over the moon at all the colour sheets to choose from, and he’s never been big on colouring. I can’t wait to start printing. lol well, that is great. I am so happy to hear he likes them. These are so cute! Thanks for sharing them at Turn It Up Tuesday. We have a LEGO class at our co op this year, I will email the teacher a link to share with her students! I’m so glad to hear you like them 🙂 Happy to share! Thanks for hosting. I really appreciate you sharing the link with others! Great FREE resource!! I love freebies 🙂 Thanks for sharing & hosting your link up this week. Pinning this one! My pleasure. We love free and we love LEGO so these were a natural matchup. I appreciate the pin! Here are some LEGO Friends activities. If you scroll down you will find some coloring pages. Thanks so much for stopping by and leaving a comment. I don’t know why I never thought of Lego Coloring pages. I just asked my kids if they would like some and the answer was a resounding “YES!” So, I will be printing them out now! Thanks for sharing @LearningKidLinkup. We hope you will come back to share your wonderful ideas with us! You need to click through the links to get to the coloring pages. Thanks. how can i doowload de pages to coloreate? Click on the links of the pages you would like to download. I find this really frustrating to access the FREE Lego printables…..I’ve Pinned it….no matter what I do it sends me to Amazon to purchase books,comic books,coloring books….I go back to the web site again(BrainPowerBoy.com) and the cycle begins again…..maybe I’m a moron but I can’t get to the site to print for free these pages…..never had this trouble when I went to PBS kids,Disney,etc. I’m sorry you are having trouble. The links for the printables are in the post. Under each LEGO topic there are links to the coloring pages. For example, under LEGO Juniors there is a link that says “LEGO Juniors Coloring Sheets” if you click that it takes you right to the coloring pages. There are also some links to Amazon to get sets or to get some of our favorite pencils etc. That is one of the ways I make money on the site so I can continue to offer so many resources for free. All of the links for the coloring pages work (I just tested them) and take you right to the coloring sheets.